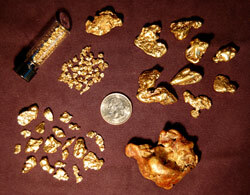 About 12 ounces of gold nuggets retrieved by PRGCI geologist Tom Bundtzen and others during metal detector analysis of the bedrock paystreak in Swede Channel, Nolan Creek, Alaska. July, 2010 — Alaska Mining and Geology a seminar conducted by PRGCI president Tom Bundtzen that describes five must-read books relevant to Alaska's mining history. This presentation is part of the 4th Annual Alaska Book Festival sponsored by the University of Alaska Press. 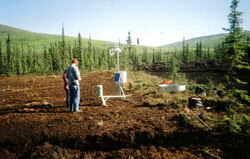 October, 2009 — Unlocking the Hines Creek and Associated Faults, Eastern Alaska Range - Evidence for Cenozoic Displacement in T70 - Interaction of Tectonics, Climate Change, Eustacy in Development of the North American Cordillera by by W. Nokleberg and PRGCI president Tom Bundtzen: Geological Society of America Annual Meeting Portland, Oregon Abstract #108-8, page 302; poster available online. 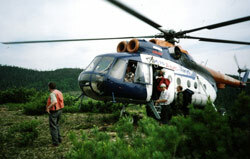 July, 2009 — An Update on the Platinum Mining Activities in the Russian Far East by PRGCI President Tom Bundtzen, in, Sudkamp, Anne, ed., The Russian Far East News, vol. 6, no. 5, July, 1977, pp. 3-5. February, 2009 — , Northeast Russia: Journal of the Alaska Miners Association, vol. 37, no. 2, pages 6-21. 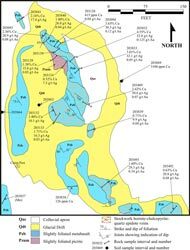 April, 2008 — Update on the Mining Activites on the Kamchatka Peninsula, Eastern Russia by PRGCI President Tom Bundtzen: Journal of the Alaska Miners Association, vol. 36, no. 4, pages 6-7; 16-25. 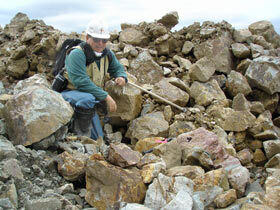 August - September 2007 — Detailed surface exploration of the Lichen Copper-silver (gold) prospect in South-Central Alaska, for Alaska Ventures, Inc.
for client Silverado Gold Mines, Inc.
October, 2006 — Project Update—Placer Gold Production from Cleanup of 2006 Swede Pay Gravels and Exploration Activities of Silverado Gold Mines in Koyukuk District, Alaska; for Silverado Gold Mines, Ltd.
April, 2006 — Project Update — Completion of 2005-2006 Swede Channel Phase I Underground development Activities on Nolan Creek, Koyukuk District, Northern Alaska; for Silverado Gold Mines, Ltd.
February, 2006 — Swede Channel 2005/2006 Development Project, Nolan Creek, Koyukuk District, Northern Alaska; for Silverado Gold Mines, Ltd.
Quaternary geology of the Lime Hills. 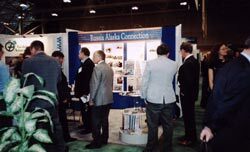 March, 2005 — Historic Gold Production and Important Gold Mineral Deposits of Eastern Russia; ABSTRACT and POWERPOINT presentation by PRGCI President Tom Bundtzen and Sergei Diakov at Prospectors and Development Association of Canada (PDAC), March 17, 2005. 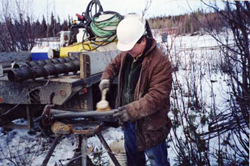 PRGCI President working with auger drill..
March, 2003 — Mineral-in-Character Assessment of Indian River Materials Site, Glenn Highway (Tok-Cutoff) South-Central Alaska; for Office of Attorney General, State of Alaska. 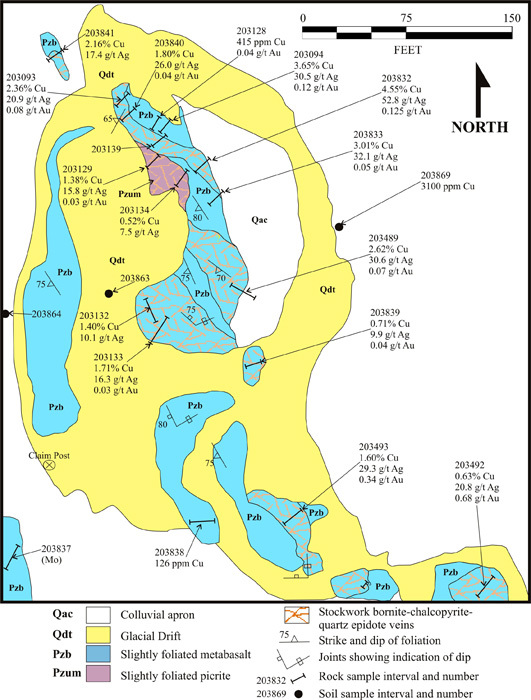 December, 2001 — Ni-Cu-PGE Potential of the Roberts PGM, Straight Creek, and Lyman Hills Prospects, Farewell district; for Platinum Palladium Holdings, Inc.
November, 2000 — Investigations of the Roberts PGM Prospect; for Platinum-Palladium Holdings, Ltd.
March, 1999 — Heavy Mineral Placer Deposits as Sources of Past and Present Metal Output — Important Exploration Guides for Discovery of Lode Deposits in Alaska, and Yukon, Canada, and the Russian Far East: Proceedings of a short course given by Tom Bundtzen, Steve Morrison, Warren Nokleberg, and Eugene Sidorov at the Prospectors and Development Association of Canada, pp. 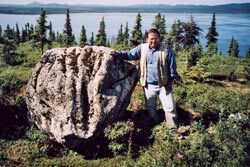 197-210.